The U.S. Department of Homeland Security is asking Congress to pass new legislation that would expand the agency’s power to surveil, research, and attack drones in U.S. airspace. Hayley Chang, DHS deputy general counsel, testified yesterday that there are a number of things that DHS “can’t do currently” because of outdated laws that have the potential to jeopardize America’s national security. In written testimony, DHS said that terrorist groups are using small drones to conduct attacks overseas and called the potential for attacks on U.S. soil a “looming threat.” Terrorists have not yet used drones to conduct any attacks on U.S. soil, but they’ve become increasingly popular with ISIS and other terror groups in the Middle East. 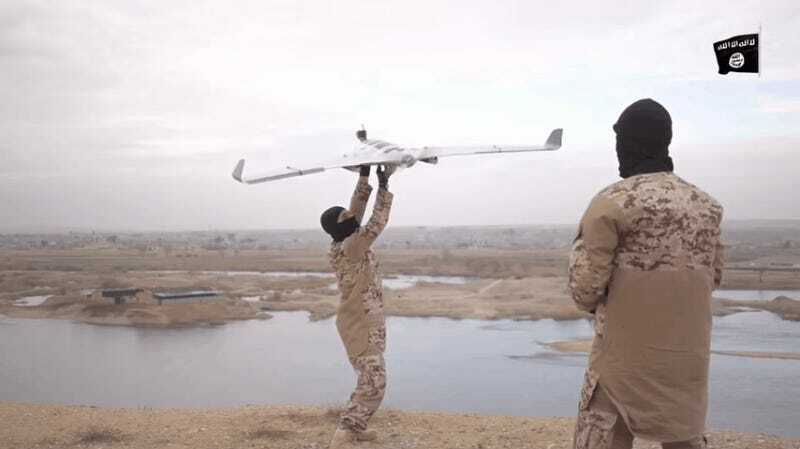 Terrorists in Syria sometimes use off-the-shelf drones to drop grenades and mortar shells. “Our efforts right now, for example, to detect drones that could pose a threat primarily rely on scanning the radio frequency spectrum. That raises questions under the Wiretap Act and Pen Trap Act for use, as well as spending any money on research or testing. Because it’s use is illegal, so testing and acquiring it is illegal,” Chang told the Senate Homeland Security and Governmental Affairs committee yesterday. Chang also cited the Computer Fraud and Abuse Act and the Aircraft Sabotage Act as old laws that have been “interpreted in new ways” to prohibit the Department of Homeland Security from thoroughly testing things like drone jamming technologies. “Because the technology use is illegal, we are not permitted under our rules to purchase equipment that’s illegal to use. So we can’t test it,” said Chang. North Dakota Senator John Hoeven, a supporter of the bipartisan bill expanding DHS’ drone powers, pressed Chang on the question of whether DHS is actually prohibited from testing jamming. Chang backpedalled a bit, admitting that they can test in a “sterile environment,” but that drone jamming was currently illegal in densely populated places like Manhattan. The proposed legislation is co-sponsored by Democratic senators Heidi Heitkamp from North Dakota and Doug Jones of Alabama, while four other Republican senators have signed on to support the bill. Drone attacks haven’t yet posed a terrorist threat to the United States, but Republican Committee Chairman Ron Johnson noted during yesterday’s hearing that “suspicious” drone flights have increased in recent years. There were reportedly just eight incidents drone flights considered “suspicious” or in sensitive areas during 2013. That number skyrocketed to roughly 1,752 incidents in 2016. But not everyone is happy with the proposed legislation. The ACLU submitted a letter to the subcommittee alleging that the new drone bill, titled the “Preventing Emerging Threats Act of 2018,” would give the government too much power. The rights organization claims that the language of the bill is too broad and doesn’t allow for proper oversight.